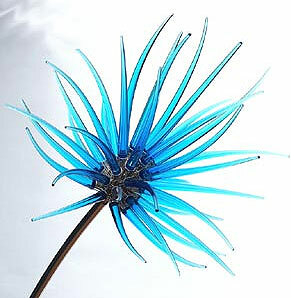 I have been down to see Sarah and Neil Wilkin, who are very busy working on their glass sculptures for the garden. The inside of their workshop is sparkling like a crystal palace with jewels for our garden. It's fantastic to see how they manage to form the glass into magnificent organic smooth shapes and I'm astonished how tough the glass is and how much force is needed for it to break. This is the flower we hope to use outside by the entrance to the garden.